Mustard-based barbecue sauces find their origins in the Carolinas and Georgia and are the perfect BBQ sauce for pork whether you are talking whole hog, pork shoulder, or BBQ ribs. These sauces add a savory, tart flavor to barbecue, but are also great on of the many foods you grill or smoke. Try a mustard sauce next time you are grilling burgers, pork chops, or even chicken. A good mustard sauce gives you a break from the traditional tomato-based barbecue sauces. Mustard sauces are best served on the side so that the diner can decide how much to add themselves. To serve barbecue sauces on the side, warm slightly to room temperature or slightly higher. Never serve cold sauce with hot barbecue. This barbecue sauce is Carolina style and combines mustard and vinegar to and extra tangy flavor. This is a classic mustard sauce and is sure to be a hit. There is a slight heat from the three peppers included in it: black, white and red. These can be increased to make this a little spicier. 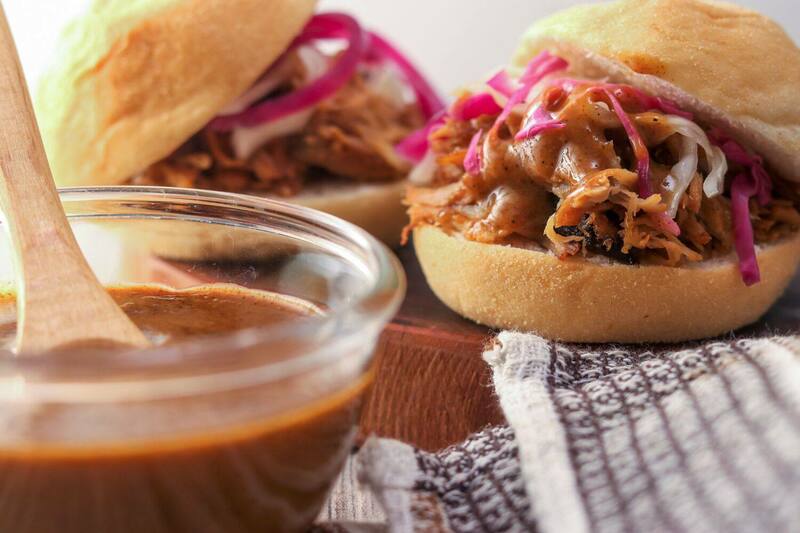 This mustard-based barbecue sauce takes the whole concept to a new level. By using balsamic vinegar instead of the more traditional cider vinegar you get a richer flavor and color. This mustard barbecue sauce is loaded with flavor, that Southern tanginess and everything that makes it perfect on all types of barbecue. Away from the coast, in South Carolina, Mustard is the main ingredient in barbecue sauce. This mustard sauce is specifically designed for smoked pork and has gained popularity as more people realize that mustard has a lot to offer barbecue. Typically mustard-based sauces are more tangy than sweet. This mustard barbecue sauce layers molasses on a base of prepared mustard and cider vinegar and then adds savory herbs to give it a rich and deep flavor that is perfect for nearly anything particularly smoked pork. Northern Georgia and the western Carolinas are famous for barbecue sauces that start with mustard. This version of the sauces of this region of barbecue has a tangy and sweet flavor. Slowly simmering the ingredients together is what makes this sauce great. In the good days, half of the great recipes started with bacon. This old-fashioned mustard-based barbecue sauce starts with bacon and is loaded with flavor and is perfect for so many things. You get a strong mustard flavor, with a touch of heat and enough sweet to make it stand out. This is a perfect sauce for pork, but also great on burgers. Most mustard barbecue sauces use standard prepared mustard (the stuff in the yellow bottle). This one starts with Dijon mustard to give it a richer mustard flavor. Add to that a course, stone ground mustard and you get something particularly great. This is a classic style mustard barbecue sauce. Use this recipe as a basting sauce on any smoked or grilled meats. As a traditional mustard sauce, this recipe is perfect for pork but equally good on pretty much anything. Starting with the sweetness of molasses and honey, this mustard barbecue sauce is rich and flavorful and perfect for practically anything, especially pork barbecue.